I hope I didn't overlook a discussion that might answer my question already. A brief background: I am conducting a study in which participants see an array of 3D objects and have to indicate whether or not the target was among the stimuli. However, I want to combine the search task with a priming design. So one trial in my experiment consists of two search displays (interrupted by a blank for 50 ms). The objects remain the same in both displays but can be illuminated from either the left or the right. When I conduct my experiment like this, the variable "dur" just increases and the search displays are presented longer and longer. I guess the multiple keyboard responses mess up the logged accuracies but I don't know how to prevent that from happening. have you already looked into your output? Maybe you are summing up some values (e.g. None) that you do not want in that sum? Thank you very much for your suggestions. I looked into the data and the variables correct_r1_m etc. just take the values of 0 and 1 (depending on whether 'timeout' was reached or what response was given). I also printed the recent accuracy and it seems that indeed all of the potential responses within a trial are being counted, regardless of the 'run if' statement. However, the variable [correct] indeed does correctly indicate whether or not a correct response was made in the course of one trial. So if i was able to access only that variable from the previous ten trials, it should - I think - work. Since the variable [acc] also seemed to have suffered under the multiple response items I tried using the reset feedback in the same way as the multiple response items. I've also fixed the error in the run if statements. Now they are 'run if [response_r1_m]==None' etc. Still, the variable [dur] just increases every ten trials regardless of the variable [correct]. 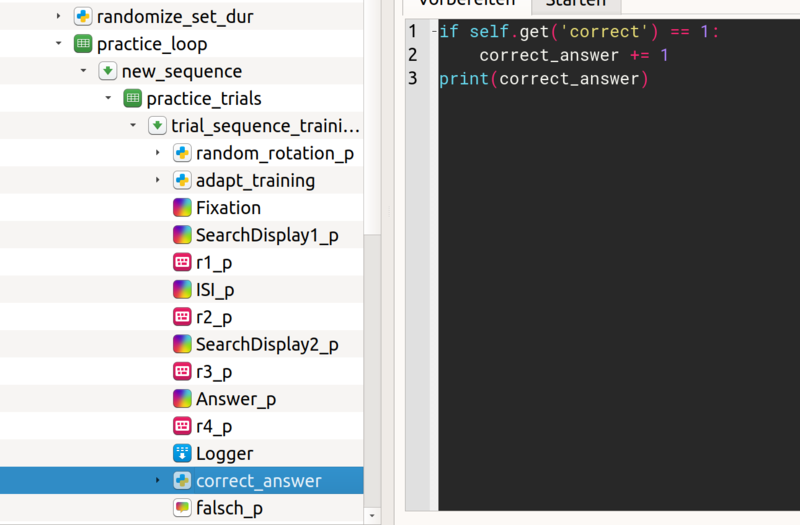 I define the variable correct_answer before the loop item. 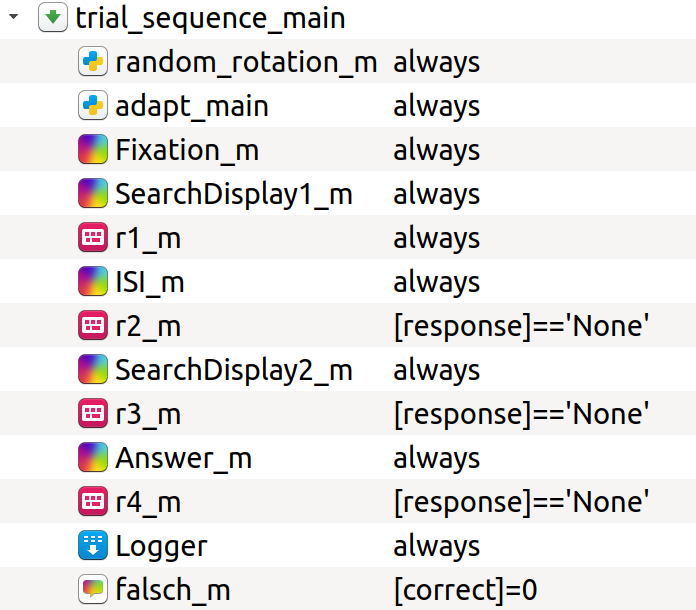 I then count the correct responses given in the inline-script after each trial, as can be seen in the picture above. Every 10th trial, I reset "correct_answer".